Leveraging technology to improve data collection in the field. Starting with installation of new assets, numerous field workstreams generate essential information. Until recently, field personnel have had to use paper forms or multiple devices with keyboard entry to capture data. With the advent of mobile technologies such as cellular data connectivity, consumer-grade GPS, bar coding, and high-quality digital photography now available on ruggedized mobile devices at a relatively low cost, mobile data capture solutions bring efficiency and accuracy to collecting installation, excavation, and inspection information in the field. 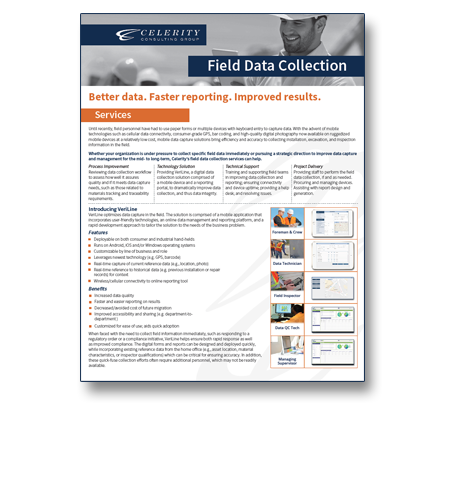 Whether your organization is under pressure to collect specific field data immediately or pursuing a strategic direction to improve data capture and management for the mid- to long-term, consider our field data collection services and solutions. Process Optimization: Reviewing field data collection workflow to assess how well it assures quality and if it meets data capture needs, including those related to materials tracking and traceability requirements. Technology Solution: Providing VeriLine, a digital data collection solution comprised of a mobile device and a reporting portal, to dramatically improve data collection and thus, data integrity. Technical Support: Training and supporting field teams in improving data collection and reporting; ensuring connectivity and device uptime; providing a help desk; and resolving issues. Project Delivery: Providing staff to perform the field data collection, if and as needed; procuring and managing devices; and assisting with report design and generation. VeriLine optimizes data capture in the field. It leverages the prevalence of mobile devices and emerging user-friendly technologies, a data management and reporting platform, and fast mobile app development approaches to deliver a powerful and tailored information solution. This solution enables key home office data to be referenced, real-time; eliminates the time between data capture and reporting; and minimizes or obviates the need for costly data migration in the future. The result: better information and better compliance. Find out more about VeriLine here.